Learn 300+ Idioms in an Easy & Fun Way! Idioms are phrases with meanings that are different from the actual words. “Let the cat out of the bag” = to reveal a secret. Traditional English courses and textbooks don’t usually focus on idioms… but they are extremely common in casual spoken English. So how can you learn idioms? Don’t try to memorize lists of idioms and their definitions – that’s NOT the best way to learn them. 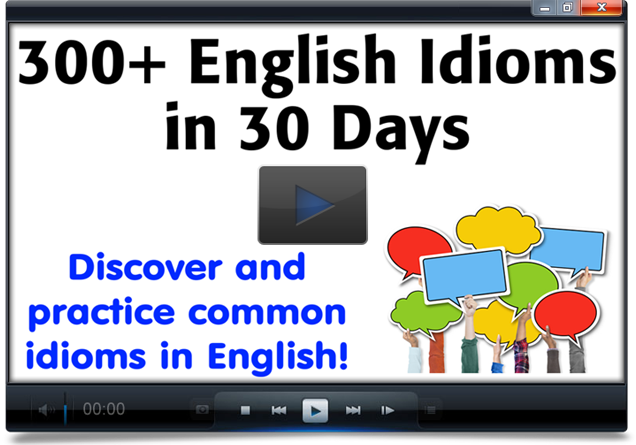 300 English Idioms in 30 Days will help you learn common idiomatic expressions used by native English speakers. This course is for you if you want to improve your understanding of idioms and learn to use them confidently. First, you’ll see an example of the idiom in context and you’ll try to guess what it means. Then, you’ll learn the correct meaning of each idiom from my explanation and examples. Finally, you can practice using the idioms with quizzes and short answer exercises. The best part is that you can send me your answers to the exercises and I’ll check them to make sure you understand the idioms and are using them correctly. This three-step method is an effective way to learn idioms because you interact more actively with each expression and you can put them into practice in your own English. The idioms course contains 30 lessons that are available in video, audio, and text format. There is no time limit for finishing! You can do the 30 lessons in 30 days if you want, but you can also take more time because you will have permanent access to the course. If you want to improve your understanding of idioms and learn to use them confidently, this course is for you. You can take a sample lesson to see the format. When you register, you get instant online access to 30 lessons in video, audio, and text form. On average, each lesson takes about 20 minutes to complete all the exercises. There’s NO time limit – you’ll have permanent access to the course, so you can take as long as you want to finish it! What level of English is necessary for this course? This is an intermediate-level course, although more advanced students will certainly find it useful as well. If your English is good enough to understand the normal Espresso English lessons, then you will be able to understand the Idioms Course. I know you’ll love the English Idioms Course and learn a lot from it – but if you’re not satisfied with your purchase, just e-mail me and I’ll send you a refund within 24 hours.